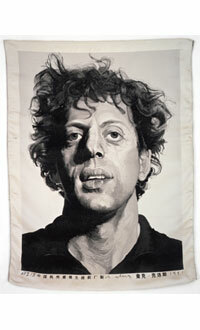 "Chuck Close: Prints, Process and Collaboration" at the Museum of Contemporary Art Australia, Sydney. “Chuck Close: Prints, Process and Collaboration” at the Museum of Contemporary Art Australia, Sydney. Renowned for his often sharply realistic canvases, Chuck Close has created numerous portraits of famous figures such as Barack Obama, Brad Pitt, Cindy Sherman or even Roy Lichtenstein. Work by Chuck Close aligns painting, photography, etching, lithography and traditional Japanese wood engraving. By designing pieces characterised by the way he pushes techniques to their very limits and his exceptional knowledge, Chuck Close is an artist of limited production, as certain engravings take two years to create. This exhibition allows visitors to appreciate his work, and it is also the first major retrospective of the artist seen in the Southern hemisphere.